1.Preheat oven to 450°. Spray rimmed baking pan with nonstick cooking spray. 2.Roll dough into a 14-inch long oval; transfer to prepared pan. With fork, poke dough several times to vent. Bake 12 minutes or until crust is lightly browned; reduce temperature to 350°. 3.In small bowl, whisk cheeses, pecans and brown sugar. 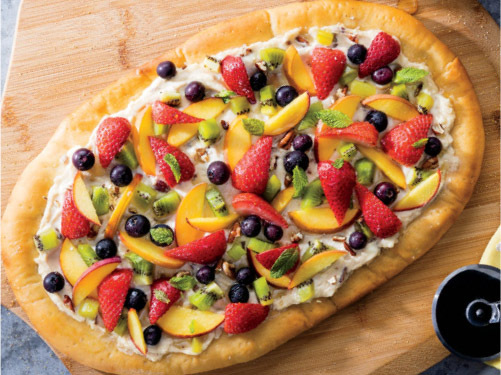 4.Leaving 1/2-inch border, spread crust with cheese mixture; top with kiwi, peach, strawberries and blueberries. Bake pizza 5 minutes or until edges are golden brown. Cut pizza into 8 slices; drizzle with honey and sprinkle with mint.